If you’re not a US citizen and currently living in the US following your MBA program, your access to financial solutions may not be clear. Will you be paid fairly in the US? What kind of options do you have to manage your student loans? Who can you go to for advice? We teamed up with https://blog.transparentcareer.com/mba-essay/ to break down the current financial climate for international MBAs, and share an exciting announcement on a new solution available to you. 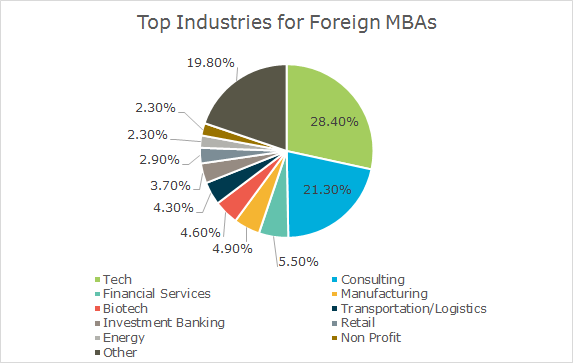 Where Do International MBAs Get Hired? By and large, the two leading industries for international MBAs are tech and consulting. Another major concern that international MBAs face is whether they’re being paid fairly while employed in the US. Our data reports that our international users typically earn $176,000 in compensation, not far off from the $190,000 reported by US MBAs. Notably, this difference in compensation comes mostly from salaries, as signing bonuses were nearly identical at ~$25,000. While idealistically there shouldn’t be any difference in terms of compensation between international and US born MBAs, our database suggests that more international MBAs work in tech as opposed to consulting, an industry with much higher earning potential, along with investment banking. Our international MBAs report working in consulting and investment banking 22% and 5% of the time respectively, which is much lower than their US counterparts who reportedly work in the two fields at rates of 35% and 9%. When we analyze this wage gap by industry, the majority of the difference disappears. With a clear expectation on earnings after graduation, we have to assess the best part of any MBA degree: student debt (are we being sarcastic enough?) MBA students, on average, graduate with $48,000 of debt, which climbs to over $72k at a 9 band essay samples. 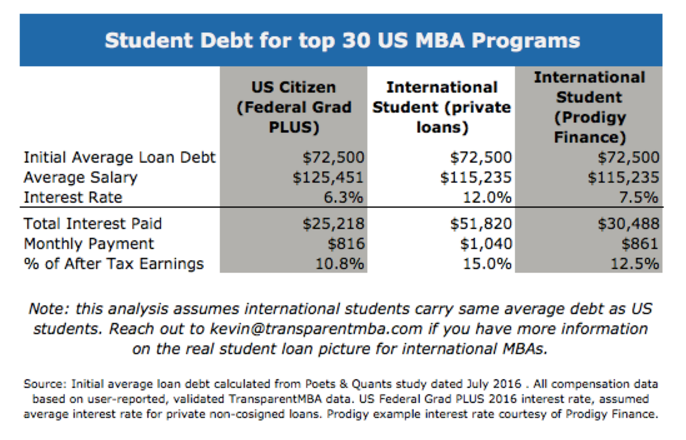 To add insult to injury, international MBAs face larger interest rates than their US counterparts, and have limited access to advising and optionality when applying for student loans. As a result, international MBAs have to pay much higher costs for the same degree. That is, until now. Prodigy Finance, who offers no-cosigner, no collateral loans to international graduate students at top-ranked business, engineering, law, and policy programs globally has just launched a brand new option for working graduates. Prodigy Finance is thrilled to announce a essay structure for college application for graduated students looking to readjust their student loans. Applicants can receive a free comparison of their current loans and the options that are now available. The savings speak for themselves. By refinancing and adjusting interest rates on loans, you can reduce monthly payments and save up to $20k. Note: These are not guaranteed rates, and may not reflect current market conditions. Finally, international students have access to great refinancing. To learn more or get started, visit Prodigy Finance’s website here. Questions or comments? Reach out. Looking for more international MBA data? Check out our list on the top companies that sponsor H1-B visas. TransparentCareer also offers free data on compensation, work/life balance, and more, all from top companies. Did we mention that it’s free? Sign up here.